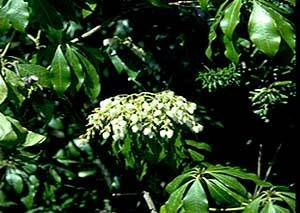 Japanese Andromeda (Pieris japonica) is extremely susceptible to this pest. Also sometimes found on Leucothoe. This pest is common to Pieris japonica (Japanese Andromeda) and injury can be quite severe especially when this host grows in full sun. Pieris floribunda (Mountain Andromeda) is highly resistant to lacebug attack and should be utilized in place of P. japonica wherever possible. 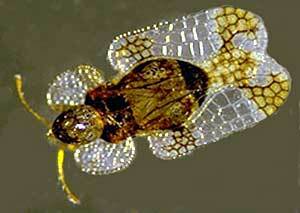 This insect over-winters as an egg imbedded within the leaf tissue. Hatching generally occurs in early June in Massachusetts. There are 3-4 generations per year in New England and activity is from late-May into September. GDD 448-2300. Adult females lay eggs within the foliage, on leaf undersides, and cover these ovipositional sites with a shiny, dark, varnish-like drop of excrement. Both nymphs and adults can be found feeding on leaf undersides. Feeding injury is displayed on the upper leaf surface as severe yellow stippling. 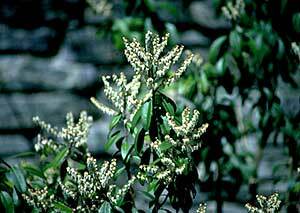 Japanese Andromeda growing in full sun is typically severely attacked; Mountain Andromeda can be used as an alternative for such plantings. 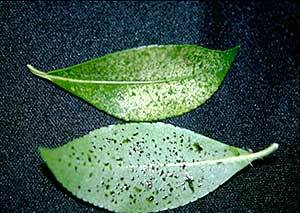 Concentrate pesticides to the undersides of the foliage for best management. 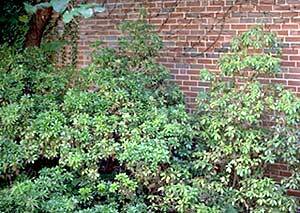 Applications of horticultural oil (at the summer rate) or insecticidal soap work well when concentrated to the leaf undersides. Note that more than one application may be necessary as new eggs hatch. Soil-applied systemic imidacloprid can also be very effective, apply after bloom of infected plants whenever possible to reduce the potential for impact on pollinators.